An urgent need for a website for an oil servicing firm was met with a cost effective solution. 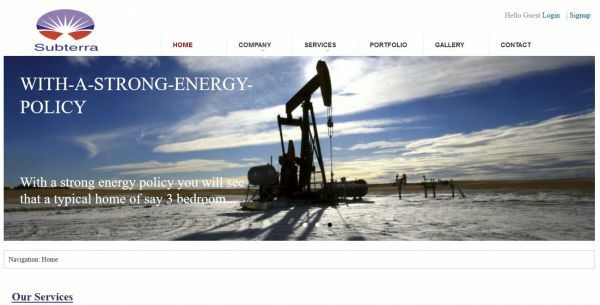 Subterra Energy Resources (SER) is committed to providing the Energy sector, particularly the Oil and Gas sector, with value added solutions, tailored to each client’s challenges in the most cost effective, safe and environmentally friendly manner while ensuring excellent corporate social responsibilities. SER aims to provide value added solutions to the O&G sector, by utilizing the vast international experience of its technical and support staff, leveraging this on a strong local industry knowledge to produce world class services. A content management system based website was developed and deployed accordingly.